Jordan Ingram reporting for FishDuck.com at Howe Field in Eugene, Ore. The No. 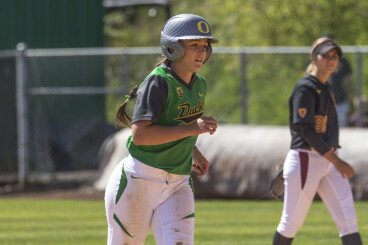 2 Oregon Ducks softball team held off a late run by No. 19 Arizona State this afternoon, beating the Sun Devils 4-3 at Howe Field in their first series sweep of ASU since 1989. Junior pitcher Cheridan Hawkins continued to dominate the Sun Devils from the mound, going the full seven innings and grabbing her 18th win this season. Hawkins leads Pac-12 with a 1.11 ERA. Lauren Lindvall jogs around bases after her solo home run Sunday afternoon. The Ducks improve to 35-5 overall (13-2 Pac-12) and continue to hold first place in the conference. ASU drops to 27-15 (5-6 Pac-12). 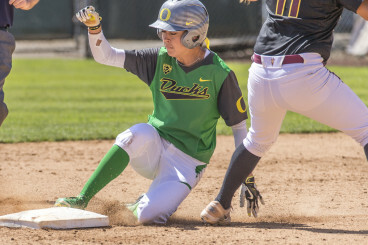 Following the Ducks’ 7-0 shutout victory in game one and their 8-run rule win yesterday evening, ASU made one last attempt to leave Eugene with a win. Sun Devils’ freshman ace Breanna Macha had a shaky start, giving up two runs in the first and second innings. But Macha held the Ducks to four runs in a game that turned into a battle between star pitchers. Hawkins, who pitched a shutout in game one, kept her foot on the gas despite the Sun Devils trimming the Ducks’ lead to a single run in the bottom of the sixth. Janie Takeda steals second base for her 95th stolen base — one off the school record. Oregon jumped out to a 2-0 lead in the first inning after Macha walked Geri Ann Glasco with the bases loaded. Catcher Janelle Lindvall brought in the second run with an RBI groundout, giving the Ducks a 2-0 lead without a hit. In the bottom of the second, freshman Laura Lindvall smashed a solo home run to left center field, pushing the Ducks’ lead to 3-0. Senior Janie Takeda had a base hit and stole second, tallying her 95th career stolen base, closing to one short of the Oregon record for that stat. The Ducks finished the inning after Jenna Lilley got an RBI from a sacrifice fly, plating Alyssa Gillespie and giving the Ducks a 4-0 lead. 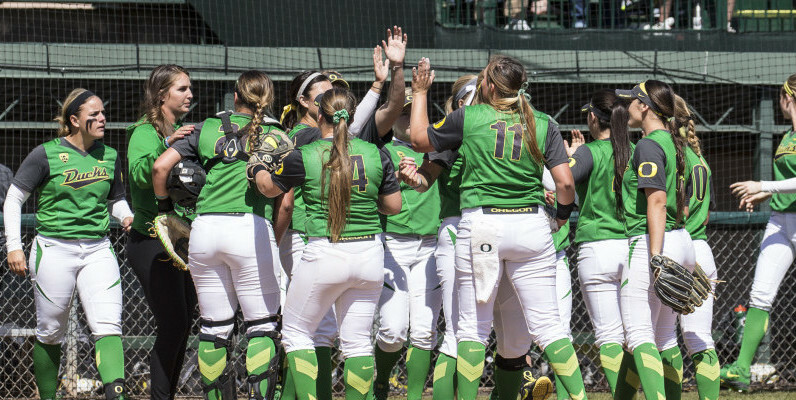 The Ducks next travel north to Hillsboro, Ore., to face Portland State for a doubleheader at Gordon Faber Recreation Complex on Tuesday, April 14th beginning at 4:00 pm.